If your morning brew tastes more bitter than usual, you may want to consider changing the color of your mug instead of adding more sugar. In a paper recently published in the journal Flavour, Australian scientists sought to learn if our perception of coffee could be influenced by the color of the cup from which it was drunk. Their results suggest this very well may be the case. 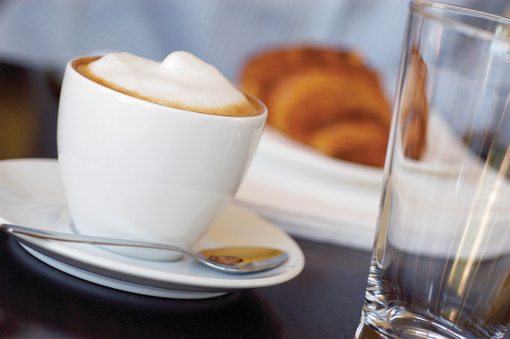 In the first experiment, a research team led by George Van Doorn discovered that white cups enhance the “intensity” of cafe latte beverages compared to clear mugs. More specifically, white cups appear to influence our perception of coffee such that it tastes more bitter. The researchers conducted a second experiment because during the first one they used cups of varying shapes, which they worried might have influenced the results. But having mugs that were physically identical — aside from color — didn’t change the results; coffee was rated as being less sweet in white cups when compared to coffee in transparent and blue cups. Both experiments demonstrate that the colour of the mug affects people’s ratings of a hot beverage. Given that ratings associated with the transparent glass mug were not significantly different from those associated with the blue mug in either experiment, an explanation in terms of simultaneous contrast can be ruled out. However, it is possible that colour contrast between the mug and the coffee may have affected the perceived intensity/sweetness of the coffee. That is, the white mug may have influenced the perceived brownness of the coffee and this, in turn, may have influenced the perceived intensity (and sweetness) of the coffee. These results support the view that the colour of the mug should be considered by those serving coffee as it can influence the consumer’s multisensory coffee drinking experience. These results add to a large and growing body of research highlighting the influence of product-extrinsic colour on the multisensory perception of food and drink. Indeed, one of the studies they’re alluding to showed that a red, strawberry-flavoured mousse presented on a white plate was perceived as being 10% sweeter and 15% more flavourful than when the same food was presented on a black plate. In the case of this new study, it’s not the whiteness of the cups that matters per se, but rather the way it brings out the clarity and vividness of the brownness of the coffee, which tends to be associated with bitter flavors. Studies like these affirm the idea that we’re psychologically primed to expect certain tastes from certain colors. Previous post: 20 fun facts about coffee! Next post: How fresh is your coffee?